Your best ROI is producing high-quality content in greater volume. Content marketing has a problem: the content itself. Creating good content is expensive and time-consuming. It requires skill and subject expertise. It’s generally a pain in the … budget. And bad content? It might be less expensive. And easier to create. But it’ll get you almost no results. You can outsource your content creation, either to freelancers or influencers. You can hire an Editor to take your in-house rough drafts and make them better. You can create far less content, and just promote, SEO, and advertise the heck out of it. You can curate some of your content. You can just ignore content marketing entirely, and stick with advertising… at least for as long as that lasts. I don’t recommend that last one. And while the other tactics are good, they aren’t actually the best option. But before I get to that, let’s understand the problem better. The challenge with content creation is actually two-fold. First, there’s the content quality problem. Your content has to be good, or it won’t work. And by “work”, I mean attract and retain an audience. Then there’s the content volume problem, aka “content velocity”. This is the frequency you’ve got to publish content at if you want to retain your audience’s attention. If you publish too infrequently, your audience will start to forget you. These two demands pull against each other. So maybe you can create great content – but only a couple of posts a month. Is that enough to keep your audience engaged? Just barely (for most publishers). And so marketers press themselves to publish more often… even if it digs into the quality of what they can produce. They might want to publish more often or with better quality, but they’re limited by their budgets. They can’t max out both content quality and content velocity at the same. More content or better content? The terms of that compromise are thorny. It’s prompted a lot of discussion about the pros and cons of content quality versus quantity. I tend to fall in the quality camp, but there have been some very persuasive articles about how content quantity might actually be king. You can’t cut quality too far, or your engagement rates will tank, but you still have to keep up the pace. Your competitors certainly aren’t going to let up. Your audience isn’t going to wait around. Leave them hanging, and they might change their content consumption habits. So what to do? It’s simple, really. You figure out a way to get more results out of the same amount of content. Ends up, your content creation problems can be solved… with the content you’ve already got. This strategy goes by a lot of names, but let’s just call it re-using content. That ends up being the single best way to escape this quality versus quantity conundrum. Got any content pieces that are more than a year old? Are they performing well - like in the top 20% of your content? If so, consider republishing them, almost as if they were new. Just be sure to give these pieces of content a little face-lift first. Optimize their SEO based on the traffic they’re actually attracting. Make sure their links and research and calls to action are all up to date. Then republish them without apology. Very few people in your audience will even notice. 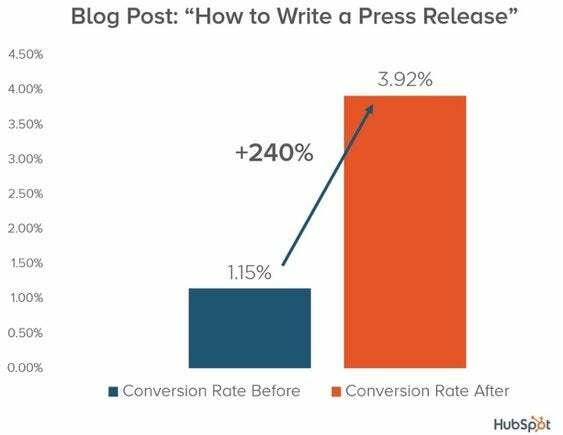 When HubSpot tried this trick, they got more than double the leads from their republished content. All for less than a third of the work it would have taken to create an entirely new post. Caption: Republishing older posts can save you a huge amount of content creation time – and nearly double the number of leads you’ll get. Typically this means taking a blog post and republishing it on, say, Medium and LinkedIn. And maybe to Business 2 Community or other sites appropriate for your niche. 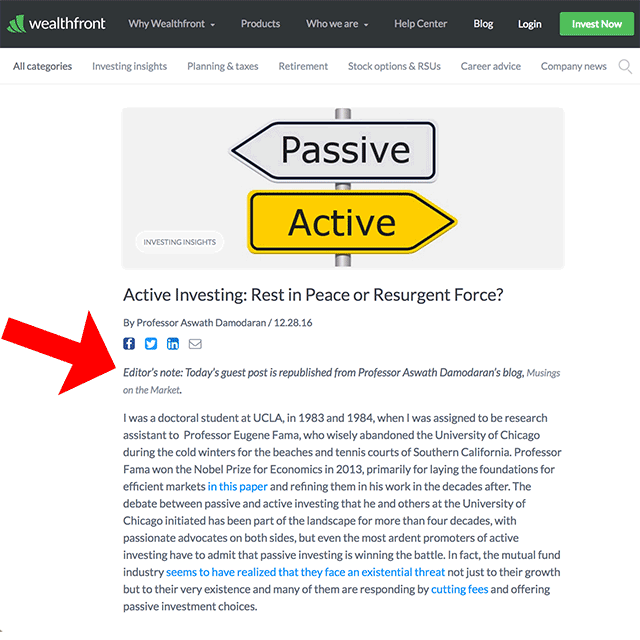 You can also get your articles republished and placed on third-party sites, with a move known as content syndication. When the quality of your content hits a certain level, editors on industry sites may reach out to you with republishing requests. Here, you take your best-performing content and convert it into new formats. You can do this reformatting with any piece of content. 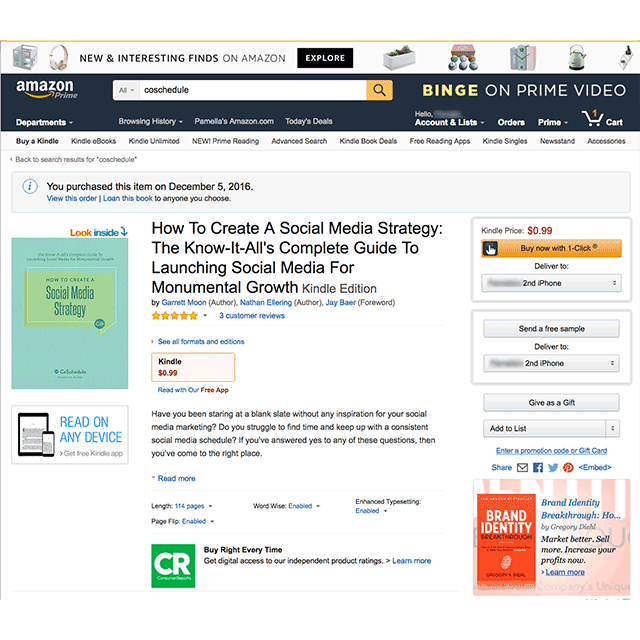 For instance, here’s a Kindle book that’s built from resources on the CoSchedule blog and content hub. They’ve turned some existing content into both a revenue generator and a lead generator. Even your emails and your answers to blog comments can become reusable content. There are more possibilities, but I think you get the idea. The funny thing here is that despite how effective re-using your content can be, most content marketers still aren’t doing it. In one survey of content marketers from the curation tool Scoop.it, only 17 percent said they repurpose their content from one format to another. Caption: More content marketers need to get better at re-using their content. I actually think that figure might be a little bit low, but it shows how little most of us think about repurposing. For instance, I bet that most of you who are regularly publishing content are notifying your email list about it. That’s repurposing your content. And most companies do have an email list – in our survey of small business owners, we found that half of them use email marketing. That’s pretty good, given than only 56 percent of them even had a website. 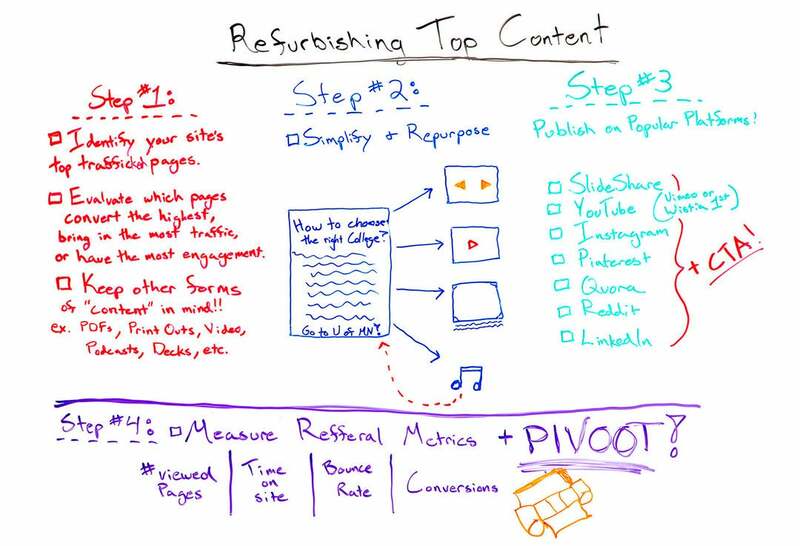 Caption: Most content marketers do repurpose or republish their content, even if it’s only to their email list. A word about these terms. Most marketers use “republish” and “repurpose” as I have here. But some sites use them interchangeably. For instance, the venerable Moz, uses the terms “refurbish” and “repurpose” interchangeably. Caption: Many marketers use the terms “republish”, “repurpose”, and “refurbish” interchangeably. Even Neil Patel mentions republishing as a “repurposing” tactic. The words really don’t matter as much as the practice. Call re-using content “shilibowing” if you want. Just do it more often. One of the advantages to repurposing and republishing is that it doesn’t necessarily have to be you (or your team) who does the work. Once you’ve got the core piece of content down, you can more easily hire a freelancer or an agency to convert it into whatever content format you want. This makes it easier to maintain your brand voice, and lets you shape the content in it’s original form. That usually means it’ll be better aligned with your overall marketing strategy. And it frees up your team’s precious time to do the stuff that only they can do. To stay competitive, we all need to get more results out of everything. Out of the same amount of budget. The same amount of time. The same amount of energy. Re-using our content is just one of the ways to do that. But as you may have noticed, I recommended re-using only the top 20 percent of your content. The best-performing stuff. Know why? Because even repurposing takes up time and energy and money. If you try to repurpose every piece of content you create at least a dozen times, it’ll slow you down. So don’t. Pick a few simple ways to re-use each piece of content (like in your email newsletter, on social media, and in a simple infographic) – then leave it alone. Give the piece of content time to perform (or not) on social media and in the search results. Then circle back and optimize your best-performing content. When you start to look at your content this way, everything you publish becomes a little test. Will this particular test (this blog post, for instance) hit the right cord with your audience? Will it meet the needs of Google, and drive a nice stream of traffic to your site? Will it have just the right angle to generate leads? I like this strategy for content development because it builds on what’s already working. It takes away one of the other problems with content – that some of it just falls flat. It puts resources into the content that has performed unusually well. Think of it almost as a multiplier effect.